With the New Year upon us it is time, once again, for our annual look at the games we are most anxiously awaiting in 2009. Our 2008 prognostications did pretty well so we thought we would keep the tradition going. As always, there is no guarantee any of these titles will be published in 2009, nor that they will be any good if they are, but we are optimistic. AT-43 [Rackham] – 2008 saw some excellent AT-43 releases and then the implosion of Rackham. Supposedly their problems are sorted out now and with luck 2009 will see more AT-43 goodness. The Cogs are the new race we should see for this year. Flames of War [Battlefront] – 2008 saw BF release a lot of Normandy material as well as another nicely done painting guide. In 2009 it looks like FoW is moving to the Eastern front (I am starting to think I’ll never see a redone M4A3E8). Their new Open Fire intro product looks interesting as does the upcoming Bagration campaign module. With luck we will see some more plastic parts for various things. WH40K [Games Workshop] – Apocalypse, the new 5th edition of the main 40K rules, and the new Space Marine codex and minis pulled GW out of possible major problems. 2009 will see more Ork releases including the new Stompa and rumored Space Marine Thunderhawk. The rumored Planetstrike product seems to be back on for a July release. Jervis mentioned a battle book (scenario/mission book) might make it out in 2009. Imperial Guard — who are finally getting a plastic Valkyrie and command squads — and Dark Eldar are both rumored to be getting major updates in 2009. I also suspect GW will have a few other surprises as well. WH40K Forge World – FW continued releasing great stuff in 2008 but Aeronautica Imperialis items slowed dramatically. 2009 will certainly see more good stuff from FW including Imperial Armor Vol 7 and hopefully more AI minis. Trafalgar [Warhammer Historical] – Warhammer Historical announced it would be releasing a set of 19th Century, age of sail naval combat rules in early 2009. This should be interesting. Mongoose Publishing – They had a pretty bad year as far as we are concerned. They ceased all miniature production and basically killed Babylon 5: A Call to Arms by not renewing the B5 license. Although it is possible we will see a generic set of sci-fi ship combat rules in 2009 based on the ACTA system. Their new in-house book production system produced poor quality books (they’ve since dumped it). All was not bad, their Battlefield Evolution skirmish system, and the WW2 World at War module, was generally well received. We should see more for it in 2009. Their WW1 version of Victory at Sea, Age of Dreadnoughts, should be out soon. Firestorm: Armada [Spartan Games] – Spartan surprised a lot of folks with their fantasy naval game Uncharted Seas. We have no interest in fantasy but we have to admit the miniatures for the game are extremely well done. They are large, crisp, well detailed resin ships. We got excited when we learned they are doing a sci-fi game next. Even if the rules turn out not to be that interesting the ship models should be of interest to all who play sci-fi ship combat games. Incursion [Grindhouse Games] – Grindhouse has intrigued us with an upcoming board/miniatures game. It is basically a ‘weird war’ version of Space Hulk and Wolfenstein 3D set in an alternate WW2 universe. We normally would not be interested in the subject matter but the description of the game and, most of all, the miniatures have us looking forward to Incursion. Conflict of Heroes: Storms of Steel! [Academy Games] – If we had to pick a game of the year for 2008 it would be Conflict of Heroes: Awakening the Bear!. It is an outstanding squad-level WW2 tactical game. It uses innovative action point and card mechanics that keep the rules to a minimum but offer great playability and simulation value. 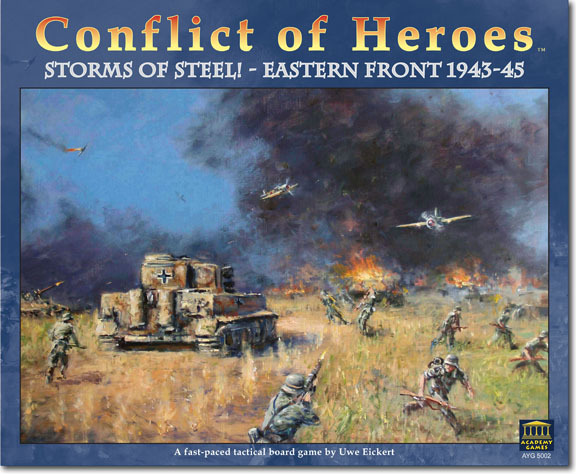 Storms of Steel!-Eastern Front 1943-45 is the next game in the series. Tide of Iron [Fantasy Flight Games] – FFG released Days of the Fox, Normandy, and the Designer Series expansions in 2008. 2009 should see something. Perhaps more Africa front or the first East front expansions? Tannhäuser: Operation Novgorod [Fantasy Flight Games] – Tannhäuser was a game we did not expect to like. It is a board skirmish game with a ‘weird war’ WW2 theme, generally not something of interest to us. But the game itself is so well done that it transcends issues with theme. Operation Novgorod will be the next expansion. Panzerblitz: Hill of Death [Multiman Publishing] – Panzer Leader, the immediate successor to Panzer Blitz, was the second wargame we ever played. We are excited to see this veteran remade. “The return of the tactical game which started it all, Panzerblitz: Hill of Death is a historical module simulating the fight in Normandy for Hill 112. This is not the Panzerblitz of the 70’s, but rather a modernized system which uses many of the core concepts of Panzerblitz while removing some of the gameyness of the original system.” PB has been up on preorder for over two years even while other games have come and gone. We have no idea if we will see it in 2009. In general MMP has been incredibly slow in getting many titles out. Odds are Lock’n Load will release their White Star Rising long before. GMT Games – The Fast Action Battle Series – Volume 1: The Bulge game turned out to be even better than we had hoped. GMT has a number of other interesting titles in the que that might see release in 2009. Sea of Glory, Elusive Victory, PQ17, and Stalin’s War are all interesting upcoming titles. Combat Commander [GMT Games] – 2008 got us CC: Pacific as well as the Stalingrad Battle Pack. 2009 will hopefully see a Battle Pack for the Pacific. Panzer Grenadier [Avalanche Press] – Avalanche got out Battle of the Bulge II: Elsenborn Ridge in 2008 but not Cassino ’44: Gateway to Rome for their Panzer Grenadier series. We should see Rome soon and later 1940: Fall of France and Operation Citadel: Kursk 1943. Lock ‘n Load Games – LnL delivered some great games in 2008 and 2009 should be even better. White Star Rising, their first WW2 version of their World at War modern platoon-level series, should be great. They have a number of other interesting titles on tap as well. Ogre [Steve Jackson Games] – In 2008 SJG announced it was working on a new Ogre 6th Edition “with high-quality components.” Initially this got us very excited. Ogre and GEV are two of the classic wargames of all time but even after 25 years SJG has never managed to release a quality boardgame version (mounted map, thick color counters, etc). Now it seems delays and talk of ‘cost overruns’ are making it look like Ogre may once again get cheated out of a quality presentation and it probably will not make it out in 2009 at all. Why GMT Games, Multiman Publishing, Lock’N Load Games, and even the new Academy Games can release luscious, high quality boardgames and SJG has been unable to do the same for one of the hobby’s classics is a complete mystery. But there is still hope. Combat Mission [Battlefront.com] – BF released Shock Force Marines for their modern successor to the classic Combat Mission series, Combat Mission: Shock Force, in 2008. On tap next is the British Forces expansion. Hopefully we will see a WW2 title soon. Theatre of War 2 [Battlefront.com] – ToW2 is due out this year. We were disappointed in the first game, mostly due to AI and path finding problems, so we will have to see if ToW2 can successfully address the issues with the original game. Heroes of Stalingrad [Lock ‘n Load Games] – LnL did not release Heroes of Stalingrad in 2008 and so far information has been slim. They did release some videos. HoS looks to be similar to some of the classic computer wargames of old in that it is more of a computerized version of a traditional board wargame. Hopefully we will see it released in 2009. War in the Pacific: Admiral’s Edition [Matrix Games] – Matrix has announced an update for the classic War in the Pacific game. Also see The Best Games Not Yet Published, 2010. This entry was posted in Board Wargames, Computer Wargames, Miniature Wargames, Modern, Naval Warfare, Sci-Fi, Wargames, WW1, WW2.